Since I really enjoyed re-doing my blue quatrefoil nails last week, I decided to recreate another one of my favorite manis! This one is an oldie but a goodie: my pink and gold X nails from when I did a mani swap with Julie from @ wannaknowasecret! (Her username is now @ julie_awouters). Check out my original version from over 2 years ago here! It's awesome to see my improvement over the years. Keep on reading to see how I created this design! I started by painting my pinky, index, and thumb nails with Floss Gloss "Perf", and a white base on my ring nail. Then I did a glitter accent nail on my middle nail, and used that same gold polish to do the X pattern over my ring finger. The gold glitter polish I used is I Scream Nails "That's Rich!" To do the X pattern, I use the right angle nail vinyls from Snail Vinyls. They are amazing! I have used them many times before and I just love them. If you're interested in purchasing these vinyls or any of their other products, be sure to use the code NAILSBYERIN for 15% off your order! DISCLAIMER: Some links may be affiliate links. 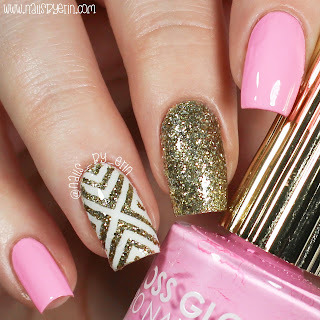 Nice and unique combination for nail art but I would like to suggest that the shade of the pink color can be darkened to provide more good look to the golden texture.